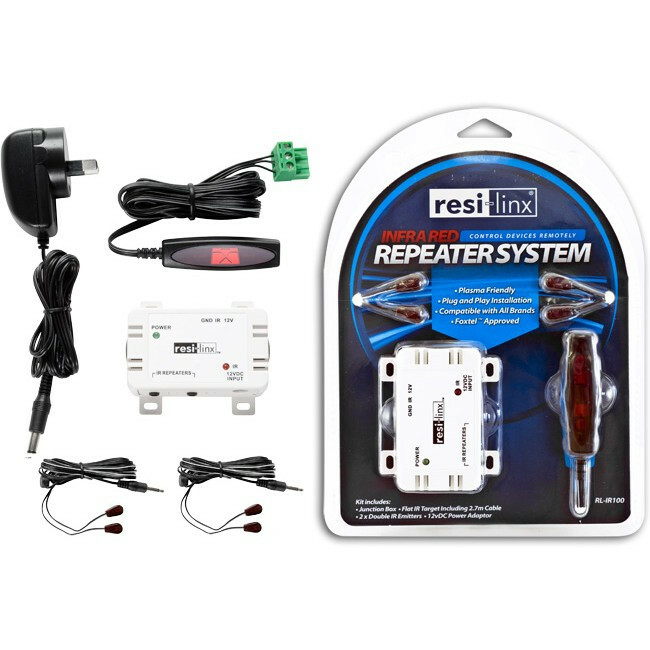 The resi-linx ® RL-IR100 is a Plasma Friendly Hard Wired Infra-Red repeater kit for use in DIY &/or custom installations, to control an A/V device at a remotelocation (up to 2.7m). All connections are plug & play, and the kit includes discrete Flat IR target, junction box, two double emitters & switch mode power supply. The RL-IR100 Junction Box features built in LED to show acknowledgement of IR commands, and is compact and lightweight. Junction Box is compact and lightweight. All connections are plug & play, no requirements for cable stripping.